FBI independent contractor Jake Cole deciphers the language of murderers by reconstructing three-dimensional crime scene models in his head - a grim gift that has left his nerves frayed and his psyche fragile. When his father, an important American painter, is almost killed in an Alzheimer's-fueled accident, Jake is forced to come home and confront a past he spent a quarter of a century trying to forget. Once there, a brutal double homicide teaches Jake that even though he has forgotten about the past, it has not yet forgotten about him. As Jake tries to make sense of his father's unhinged existence, he discovers thousands of seemingly meaningless canvases stacked in the studio - a bizarre trail of dust-covered breadcrumbs that Jake believes lead to a killer called the Bloodman. All of his work seems to come apart just as another malevolent beast descends on the town - a Category 5 hurricane that is as unstoppable as the murderer. Pinned between the two forces of nature, Jake realizes that old ghosts are on the move. 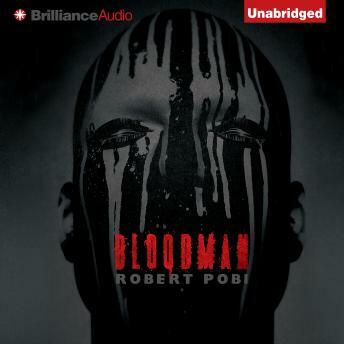 Bloodman will leave you reeling long after you have finished listening to it.